Possible line-ups: Tranmere (3-5-2-): Davies; Buxton, McNulty, Monthe; Caprice, Ridehalgh, McCullough, Pringle, Perkins; Dagnall, Norwood. Northampton (3-5-2): Cornell; Goode, Taylor, Pierre; Facey, Buchanan, McWilliams, J Williams, Bridge; A Williams, Morias. James Heneghan’s preview: It may well be a case of things getting worse before they get better for the Cobblers given the two tough away games that await them over the next four days. On the back of Saturday’s 4-0 drubbing at home to Colchester United, Town make the long trek up to Merseyside to face play-off hopefuls Tranmere Rovers on Tuesday evening before league leaders Lincoln City are the hosts this coming Saturday. The Cobblers desperately need a positive response at Prenton Park tomorrow night, even if it does not come with three points. Weeks such as this one are unlikely to define their season but good performances have been increasingly hard to come by so two decent showings at Tranmere and Lincoln would be most welcome. Unless Town win both games, their fate this season will be decided by what happens in the following 14 fixtures and perhaps specifically the next three when they host Crawley Town and then head to Stevenage and Crewe Alexandra. Tuesday’s fixture looks a tough one on paper but Tranmere do not go into the game in sparkling for themselves, winning just one and losing three of their last six matches in all competitions. That poor run, which includes a 7-0 thrashing at the hands of Premier League Tottenham in the FA Cup, means they have ground to make up in the play-off battle and should give Cobblers fans some hope of a positive result on Tuesday, though it must be said Colchester were on a similar run of form before Saturday and we all know what happened next. It continues to be a mixed bag on the injury front for Keith Curle who remains without Sam Foley and George Cox while Sam Hoskins and Jordan Turnbull are doubts after both missed Saturday’s game. 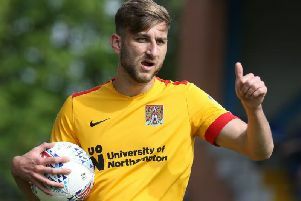 It remains to be seen whether Marvin Sordell and John-Joe O’Toole can play twice in four days after so long out, but the Cobblers have able replacements in Andy and Jay Williams should Curle wish to freshen things up. Changes are somewhat inevitable given both the manner of Saturday’s loss and Curle’s tendency to tinker, but whatever formation and personnel he settles on, time is running out to find a winning formula.